The devoted reader will recall that I earlier sketched a “little language” for mocking Clojure functions. I’ve finished implementing a usable–perhaps even pleasant–subset of it. I invite you to take a look. In keeping with my whole “work with ease” thing, I’ve made it dirt simple to try it out: one click and two shell commands. You don’t even have to have Clojure installed. It’s often the case that a class has one or more collaborators that are used by many of its methods. When you want to override one for testing, you can either pass the test double into the constructor (probably as a default argument) or you can smash the double into an instance variable you happen to know points to the collaborator. I’m not bold enough to do that yet. Me: You careless oaf! You burned up my lawn! Him: I admit it. I take full responsibility. Sorry. Me: You’re going to pay for this damage, you know. All of it. Him: I will do that. Me: I bet that big old maple that overhangs the house is going to have to come out. That’s going to cost you a bundle. Him: Oh now, it doesn’t look that bad. Me: I had a tree hit by lightning once. Didn’t look much worse than that, but carpenter ants got into it and the tree had to come out. The guys who took it out told me I should have done it right away, that the tree was worse off than it looked. I’m not waiting this time. Him: Uh… Don’t know all that much about trees. Me: Neither do I. Look. Let’s simplify this, keep at least some of it out of court. Let’s get someone with experience at judging these kinds of damages and have him decide, shrub by shrub, tree by tree, what you owe. Him: Like the independent mediator written into lots of contracts. Some time passes as we dicker over who we both trust. Me: That maple is four stories tall! Him: Hey, I still think it’ll be alright. But OK—so long as we get that mediator guy, the one I trust. Me: And I want you to put the money in escrow. Him: Aw, c’mon. You know I’m good for it. Me: Yeah, well, my trust in you is not super-high right now. Me: Look. Back out of the deal if you want. You’re going to pay one way or the other. You can do it quickly or drag it out. Your choice. Him: OK, OK: it’s a deal. I don’t like that. When the test fails, it’ll likely be hard to discover how the expected and actual values differ. And I bet that a failure would more likely be due to a typo in the expected value than to an actual bug. The test is just awkward. Development order - Test-down or REPL-up? It’s often said that the Lisps are bottom-up languages, that you test out expressions in the REPL, discover good functions, and compose them into programs. A lot of people do work that way. A lot of people who use TDD to write object-oriented code also work that way: when implementing a new feature, they start at low-level objects, add whatever new code the top-level feature seems to demand of them, then use those augmented objects in the testing of next-higher-level objects. For I guess about a year now, I’ve been experimenting with being strictly top-down in some projects. I find that leads to less churn. Too often, when I go bottom-up, I end up discovering that those low-level changes are not in fact what the feature needs, so I have to revisit and redo what I did. I get less disrupted by rework when I go from the top down (or from user interface in). It’s not that I don’t blunder—we saw one of those in the previous installment—but those blunders seem easier to recover from. That’s not to say that I don’t use the REPL. We saw that a little bit in this program, when I was writing neighbors. It’s perfectly sensible to do even more in the REPL. I think of the REPL as a handy tool for what XP calls a spike solution and the Pragmatic Programmers call tracer bullets. When I’m uncertain what to do next, the REPL is a tool to let me try out possibilities. So I might be stuck in a certain function and go to the REPL to see how it feels to build up parts of what might lie under it. After I’m more confident, I can continue on with the original function, test-driven, reusing REPL snippets when they seem useful. I don’t claim everyone should work that way. I do claim it’s a valid style that you’d be wise to try. I’m something of an obsessive about test notation, and I’ve been endlessly fiddling with a Clojure mock notation. I implemented its first version as a facade on top of clojure.contrib.mock. As I experimented, though, I found that keeping my facade up to date with my notational variants slowed me down too much, so I put the code aside until the notation settled down. I’ll write a web app in this style, using Compojure. Boldly, I will here use one test to define both cell-at and neighbors (as well as the test helper have-coordinates that checks a list of cells against a list of coordinates). I can build neighbors from what I’ve tried out. To make the test pass, I’ll continue to use vectors for cells, hiding them behind a simple functional interface of cell-at, x, and y.
border's result is also stored in world where living? will use it to decide whether a given cell is alive or dead. My first thought was that I could use the set idiom I used above—the bordered world could just be the set of all living coordinates. Sneakily, any location not in the set would represent a dead cell. That would be great for implementing living?, but it wouldn’t work for tick, which has to process not only living cells, but also the dead cells that make up the border. That’s intolerable. And yes, I bet at least half of my two readers thought I was mistaken not to think about data structures at the very beginning. However, my strategy with Clojure TDD has been to put off thinking about data structure as long as I can, and I’ve been surprised and pleased by how often I ended up with simpler data than it seemed I would. I’ve found that, given the use of globally-available immutable “background” data, much of what might have been explicit data structure–vectors of maps of vectors of…–ends up in the implicit structure of the computation. More about that, though, will have to wait for another post. When I wrote that, I remember that the still small voice of conscience objected to the way I was both stashing the bordered-world away as background and simultaneously picking it apart with map. That just felt weird, but I argued myself into thinking it was harmless. It was not. Really, since my whole program takes input [x y] pairs (such as *vertical-blinker*) and turns them into a different set of [x y] pairs, most of my work ought to be done with those pairs. I should be thinking about locations of cells, not cells themselves. In that way of thinking, border shouldn’t produce “cells”. It should take locations of living cells and produce locations that point to both living cells and adjacent dead cells. using-cell-oracles-from should produce any wise and oracular functions we need. So far, that’s just living?. As it turns out, changing my mind about such a fundamental decision was easy. What did I have to do to the code? I had to write using-cell-oracles-from. Here’s a test. I won’t show the code that passes this test—it’s a somewhat grotty macro (but a simple transformation of the earlier against-background). You can see it in the complete source for this post. I did a quick global-replace of “cell” with “location” and tweaked a couple of the resulting names. Although both you and I know that locations are just pairs, I retained the functions make-location (formerly cell-at), x, and y to keep the code insulated from the potential of another change of mind. The ease of this change makes me happy. Even though I blundered at the very beginning of my design, the way stub-heavy TDD lets me defer decisions—and forces me to encapsulate them so that I have something to stub—made the blunder a not-catastrophe. I wish I could say that I blundered deliberately to demonstrate that property of this style of TDD, but that would be a lie. Only one function remains: add-border-to. That’ll be pretty easy, but this post is already too long. The next one will finish up the implementation and add whatever grand summary I can come up with. I picked data for the top quintile of people, figuring that you, dear reader, were most likely to fall into that category. The after-tax income of the prototypical top-quintiler. 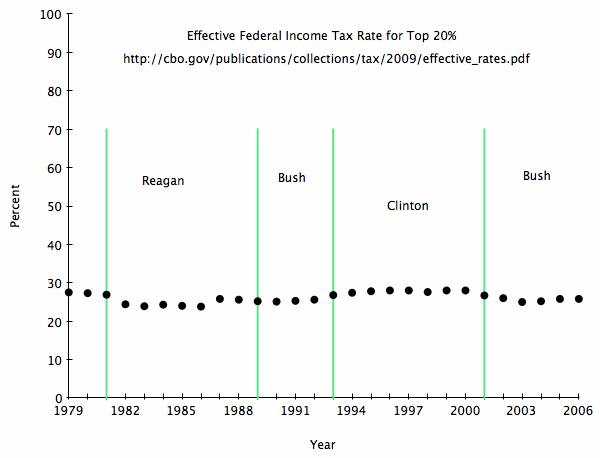 The after-tax income assuming that, starting with 1979, effective tax rates never increased. That is, every decline to a new low was allowed, but not the reverse. So the effective rate remained at its 1986 low of 23.8% until 2003 (the last year for which I could find data). 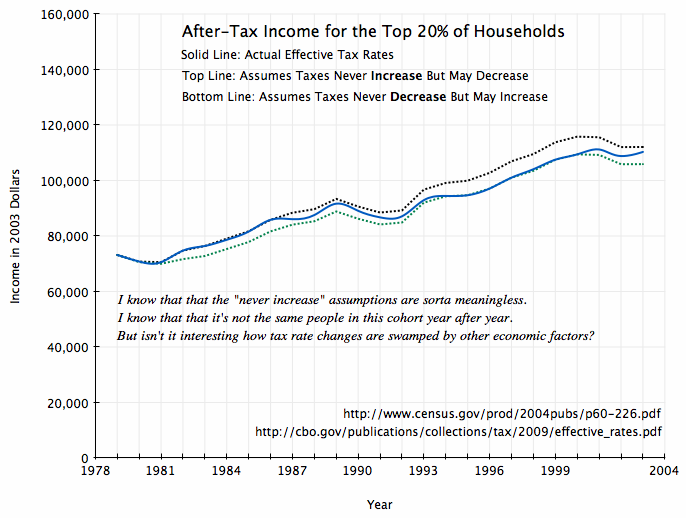 The after-tax income assuming the reverse: that only increases happened. So the rate remained at 27.5% until the 1995 increase to 27.8% and got pegged at 28% the next year. When it comes to taxes, difference between a Reagan and a Clinton is just not that huge. Choosing who to vote for based on tax zealotry is probably silly. Lots of other things the government does has a larger effect on your income and your children’s. I could be missing something. What would mocking or stubbing mean in a strict(ish) functional language? What’d be a good mocking notation for Clojure? How do you balance the outside-in style associated with mocks and the bottom-up style that the REPL (interpreter) encourages? Here’s an example from Conway’s Game of Life. It begins with an implementation suggestion from Paul Blair and Michael Nicholaides at the Philly Code Retreat. Instead of thinking of the board as a 2×2 array of cells, with some of them dead and some alive, think instead only of living cells, each of which knows its coordinates. Here’s an example that shows how “blinkers” blink from generation to generation. This is my notation for a straightforward non-stubbing test. The value on the left is executed and it’s compared (for equality) to the value on the right. I’ve started coding outside-in, and I’ve named the first function I need: next-world. The pending bit is just there because (sadly) Clojure makes you declare functions before mentioning them. pending just creates functions that print that they’ve not yet been implemented. There are two odd things going on here. I think of the Clojure programs I’ve written this way: there’s a big stateful universe out there. At some moment, a snapshot of relevant bits of that universe is presented to my pure functional program. It churns away, presents the results back to the big stateful universe, and then disappears. Given that bias, I find it convenient to think of the universe-bits not as data to be passed around, but as the unchanging background behind my code’s calculations. Any of that code should be able to reach out and grab bits of the relevant background by calling dynamically bound functions of no arguments. This essay is supposed to be a sketch of TDD in Clojure, but here’s the second function I’ve written without tests. What’s up with that? I’ve tentatively concluded that testing functions that map one function over a sequence is the moral equivalent of testing getters and setters: not worth the trouble. But don’t fear, successor is worth testing, and we’ll do that next. Almost next. In object-oriented languages, I think of mock-driven-design as a way of teasing out collaborators for the object I’m building. I push responsibilities for work onto objects that I’ll implement later. Mocking lets me defer the implementation of those objects until I’m ready, and creating some examples of the API teaches me the (implicit) specification for the new object. That says that, for any cell you care to provide, f of that cell will be 10, provided g of that cell is true and h is 2. If either of those latter two facts don’t apply to the cell, I’m not saying what f’s value is. I use the funny ...cell... notation in the way that mathematicians use n to talk about any integer. (They call that universal quantification.) I don’t want to create a particular cell because I might need to specify properties that have nothing to do with the function I’m working on. This notation says that nothing about the cell is relevant except for what comes after the provided. The falsey bit in the first line is because Clojure has two distinct values that can mean “false”. falsey is a function that takes the result of the left-hand side and fails the test if that result is anything other than one of the two false values. I’m using it because I don’t want to overspecify living?. There’s no reason to care which of the two “false” values it returns. There’s a problem with this test, though. Remember what I said above: the left-hand side gets evaluated and handed to falsey. That means living? has to have a definition—which means I’d have to settle on how the code knows whether a cell is alive or dead. I like doing one thing at a time and putting off decisions as long as I can, and right now I’d rather be focused on successor instead of cell representations. OK. The next figure gives the whole set of Life rules, expressed as executable tests. (Well, executable as soon as I implement the testing framework.) Notice that I called the outer wrapper know (a fact) instead of example. know seems more appropriate for rules. The two forms mean the same thing. This isn’t the tersest possible format—a table would be better—but it’ll do. I think it’s reasonably readable. Do you? I could go breadth-first—with border and unborder—or go depth-first with one of the functions on the second line. In this particular case, I’d rather go depth first. I’ve avoided deciding on a representation, so I don’t know yet what border should do. If this installment meets your approval, I’ll add another one that begins work on—oh—probably living-neighbor-count is the most complicated, so it’s a good one to chip away at. Most people who self-identify as enthusiasts of the free market loathe trial lawyers. I believe they do so out of tribal loyalties, not from reason. In this essay, I’ll only address the “not from reason” part. Some people are faith-based free-marketeers. They believe that in our current economic organization the market would make the correct decisions in the absence of regulation. I distinguish these people from those who believe that, given a different economic organization, the market would make the correct decision in the absence of regulation. The difference between the two is that the faith-based free-marketeers pretend that externalities do not exist. Externalities are cases where part of the cost of a good or service is not paid by participants in a market transaction. Example: If your factory is upstream of me, and you dump sewage in the river I get my drinking water from, you damage me but (in our society minus government) I have no recourse. Your customers get cheaper goods than they should. (A somewhat famous) Example: You run a railroad on your property. Sparks from your trains ignite my wheat field. Who should suffer? How much? Example: As a fisherman, I gain direct benefit from overfishing, the cost is spread amongst all other fishermen, and there is no way for them to get compensation from me. The free-marketeers I’m concerned with solve this problem by extending property rights to everything. I have property rights to the water I drink from, so I can charge you for the right to pollute. In a pure market situation, it makes as much sense for me to bill you for my burned wheat as it does to force you to install spark arrestors. If fish are proportionately owned by fishermen, my overfishing is in effect stealing someone else’s property. However, there’s a problem even in the case of perfect information and friction-free litigation: How does BP know how much to adjust its operations? That must be done by understanding the cost (and benefit) of previous spills. But how is the cost arrived at? By what was previously paid out. (Yesterday’s weather, for you Extreme Programmers out there.) But BP (or its insurance company) and any patch-of-Gulf-owner are likely to disagree about the degree of damage and thus the amount of compensation due. For any given spill, its cost is disputed. But a single number is required. How can this be handled? One way is by our existing system of litigation: BP lawyers and the owner’s lawyers (or lawyers for a collective of owners) fight it out in front of some impartial authority (a judge or jury). If you agree with that, you love trial lawyers because they’re required to make that system work. However, many free marketeers find trial lawyers unsavory, so they envision some more dispassionate entity. People of my generation often read Heinlein in their formative years and long for the role of “Fair Witness” - someone who, due to deep training, does not let her own preferences sway her judgments. Suppose there exists a Fair Witness-like adjudicator. There are two possibilities: (1) she gains all knowledge needed to decide the case herself, or (2) she relies on proxies who feed her information. In a market world, I suppose that different Fair Witnesses would offer both approaches. I claim, though, that the proxy approach (2) would win out. However, what are marketing, salesmanship, and advertising but an argument that your competitor’s counter-argument is weak? It is an inherently adversarial relationship, using the consumer as the highly-interested judge of competing arguments. This is precisely parallel to the situation of two advocates arguing in front of a Fair Witness. Therefore, the skills of an advocate—a trial lawyer—are essential for the market process of determining how much BP should spend on safety (or, equivalently, how much its insurance provider should insist it spend on safety). I should note that I am not a believer in the wisdom of the market—due in part to my readings in behavioral economics and asymetrical information—but as a software person I run into a ton of people who claim to believe in the free market but are in effect supporters of America’s peculiar system of crony capitalism that favors unnaturally-large (according to their expressed beliefs) business. Or they are glibertarians. This essay is for them. For some time now, I’ve been skeptical of the ROI of end-to-end automated tests and of the value of automating the kind of business-facing examples that drive development. I’ve walked the walk. The Critter4Us app that’s being used at the University of Illinois vet school does not have these kinds of tests. I’m doing contract programming on another app. I make heavy use of Growing Object-Oriented Software-style tests, but I don’t have any that are larger than unit-sized. I have written some partial end-to-end tests that exercise the route through the server from HTTP Request to HTTP Response*. Even those are probably not justifiable if the question you care about is “Do they find bugs manual testing would have found, only faster?” However, I write them for two reasons. First, they make me feel better about the pacing of my work, and my own ease-of-work is important to me. The second reason is that I believe a lot of progress in Agile has come through people wanting something, being so naíve they didn’t realize it was impossible for them to have it, so they changed their context to make it possible. So I’m edging toward writing end-to-end tests as a way to force myself to figure out how to make them cost-effective to me. However, these apps—while “real”—are relatively small, and I do see occasional tweets saying “Having those automated end-to-end tests really saved our butts today!” I’d like to examine some of those bugs in detail so that I can (preferably) discover what kinds of bugs make end-to-end tests worthwhile and thus what specific kinds of end-to-end tests are worthwhile or (less exciting) figure out what unit-style tests were missing. So email me if you have a juicy bug. But please be aware that “in detail” likely means NDA-level detail and possibly a fair amount of email back-and-forth. And I will want to describe the bugs and systems (in sanitized form) to a worldwide audience. “Why” documentation - in code? in tests? With one major exception, I’m one of those “if your code needs documentation, it’s not written right” people. The exception is code that answers the question “Why do that instead of this other obvious thing?” If I’m answering a “why” question with a comment, I always wonder whether the comment should go in the code or in the tests. As an example, consider an app I’m working on. In response to a user request (picking a menu item), a potentially long-running network transfer starts. What the user sees while that’s going on is that the app switches to the tab that normally displays the table of data she’s asked for, that table has been erased, and there’s a progress indicator spinning there. Getting that to work is more complicated than you might think. Let’s pretend you’re trying to understand it. First question: do you think the comment is helpful? If not, should I also explain that the Savon SOAP library doesn’t (seem to) allow asynchronous operation? 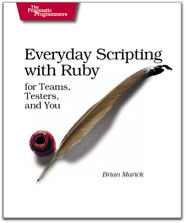 Should I explain that RubyCocoa doesn’t allow threading, so I can’t invent asynchrony myself? If you think the name helps, does that suggest I should change the name in the product code to something other than load? What?